For all those of you who want to download APK from play store, this is a complete guide that can help you to do so. Check out the following ways to download APK. Note: As per the Google’s Terms of Service using APK Downloader is prohibited as this would allow the user to access Google Play using means apart from those that were offered by Google. Implement the following tricks at your own risk. The inception of smartphones has changed the lives of common men immensely and has eased up a lot of complicated processes. But there is one problem that even the smartphones couldn’t resolve regardless of the platform that you are using and that is the problem of shortage of space. Users always complain how they don’t have enough space in their devices to store all the data that they want to store. Lack of space in devices may also cause the device to function improperly and you might have trouble while trying to operate. So in this article we are covering issues related to the above problem. Most of the smartphone users are not aware that APK files can be downloaded from the play store using a computer. All you have to do is download and store the file on your computer and later connect your device to the computer and move the file to the device. The process is valid for all devices, be it smartphone, tablet or any other. These APK files can also be stored in hard disk or any other storage devices available. Since you are aware of the alternate storage method, let’s discuss the solution to the problem mentioned above. Google Chrome and Firefox are the best options that you must choose from if you are downloading APK files by using browser extension. CodeKiem’s APK downloader extension is what we are using for Firefox. Since this extension is now not available for Google Chrome it is advisable that you try the Direct APK Downloader chrome extension if you are using Google Chrome. Both the mentioned extensions are the best and work efficiently with their respective browsers. In order to make this method more efficient, it is necessary that we use the downloader extension while downloading the APK files. Once you have downloaded the extension on your computer browser, you will have to fill in your email address. This must be the same email ID that you have use for your Google Play Store on the device. The device ID is also the same email ID that you have used for the play store and submitted as email address. Your email ID is essential to be able to log in to use the extension file downloaded earlier. Finding the Device ID mentioned above is much easier with the help of the application called Device ID from google play store. As soon as you open the device ID app, it will show your email ID, making your process much more effective and easier. The Device ID is essential as it has some has some crucial details such as your email addresses and the device code name. It allows you to use either of your email IDs along with the corresponding password to log in. 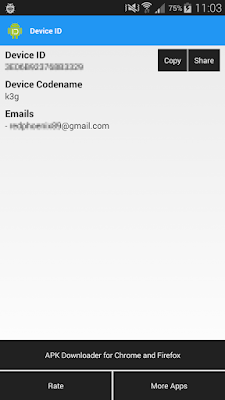 this application also enables you to look up for the Android ID for the APKDownloader. If you have gone through all the above steps, you can download all the APK files that you want and save them all to your computer. All you have to do is go to the Google Play Store and tap the download button for any app that you wish to download.You will see that you will see the ‘Download APK’ option instead of ‘install’ or ‘buy’ option. Tap on the Download APK option and your app will start downloading. Till now we have learned how to download APK files with the help of a browser extension. Following is the method that you can use to install the APK file that you have downloaded on your smartphone or any other device. Once you are done with the downloading, it is time to discuss the installation procedure and here are the guidelines to install APK files on your Android device. 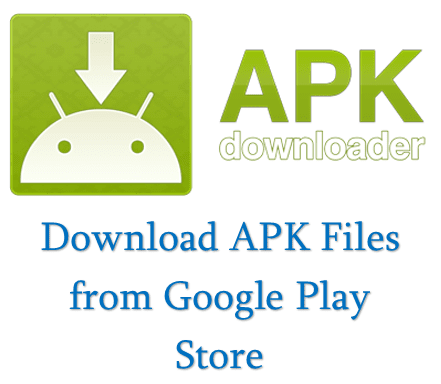 Following are some easy steps that you need to follow in order to install the APK files. The very first step is to enable the option ‘Unknown sources’. In order to do so, go to Settings in the device menu and then tap the Security option.This step will allow you to transfer your downloaded APK files from PC to your device. Establish a connection between your device and PC using USB cable. Let the essential drivers install on your Android device once the connection has been build. Once the connection is set up, create a copy of the downloaded APK files on the desktop of your PC, to get it ready for the transfer. Go to the menu of your smartphone and tap the option File Manager. In there you will find the folder named ‘downloads’, open that.Look for the APK files that you have transferred from your PC on to the device and open it. You will see a pop up that will ask for your permission and will the installation procedure will begin on your device. It is essential to remember that you have to disable the option of ‘Unknown sources’ so that the security of the device is not jeopardized. This is one of the ways to download the APK files. Since there are two procedures to do so, we will also discuss with you the second method as well. Another way to download APK files from the Google Play Store is with the help of specific websites. It is also important to notice that with this method a specific link of APK files will be generated that for the users to access. There are certain websites that allow users to download APK files.You will find sites like Evozi APK Downloader that allow you to enter URL of apps and then will create a direct downloadable link for you. Keeping the site in mind we have compiled for you the steps required to download APK files from Evozi APKdownloader website. Go to the Google Play Store and look for the app that you wish to download. A URL will appear at the address bar once you have reached the app in the play store. Copy this URL. Now navigate to the website Evozi’s APK Downloader and paste the URL in the box that appears at the top of the website. Tap on the Generate download link button to get the download the link of the particular app and store on your PC. This stored link can now be transferred to your android device with the help of the USB cable and you will be able to install the app. So these are the two ways to download the APK files.If you have any queries or want to add anything to this article, do let us know by commenting below. Nice post. To know how to download Android apk click here.